The BE@RBRICK crew is back in Hong Kong again this summer! Harbour City shopping mall transforms "Ocean Terminal Deck", the latest tourist attraction and observation deck in Hong Kong located at Ocean Terminal of Harbour City, into a "Beach" from 5th Jul to 5th Aug, 2018; and invites over 30 BE@RBRICKS with 8 brand new summer looks to join the beach party. The BE@RBRICKS also help to build two over 4-meter-tall Giant "Sand Sculpture" BE@RBRICKS, including one 7000% BE@RBRICK who greets all visitors at 2 sides of Victoria Harbour; and one 8000% BE@RBRICK lying on the grand steps to enjoy sun bathing. Let's join our Summer Party together and enjoy the sunshine with stunning Victoria Harbour view! This Summer, Harbour City transforms "Ocean Terminal Deck" into a "Beach" and invites over 30 2000% & 3000% BE@RBRICKS with 8 brand new summer looks (including Hawaii Oppa, Bearkini and Diver, etc.) to join the beach party. Some BE@RBRICKS are playing hide-and-seek on the beach while others are enjoying the sun under beach umbrellas. 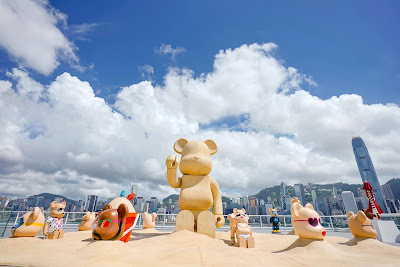 The BE@RBRICKS also beat the heat by building two giant "Sand Sculpture" BE@RBRICKS, including one 7000% (4.9M) BE@RBRICK who sits on the beach to greet all visitors at 2 sides of Victoria Harbour; and one 8000% (5.6M) BE@RBRICK who lies on the grand steps of the Ocean terminal Deck to enjoy sun bathing with stunning Victoria Harbour view. Cool down at the BE@RBRICK TUCK SHOP with a series of Harbour City X BE@RBRICK limited edition premiums, including BE@RBRICK x ISEE iSEE Jumbo Ice Pop (Price: HK$60) , Jumbo Ice Pop Mold (Price: HK$150), Fresh Juice (Price: HK$40), Beach Towel (Price: HK$120) and Swim Ring (Price: HK$120); all premiums will keep you feeling summertime cool even when the temperatures continue to rise. During the promotional period from 7 Jul -- 5 Aug, 2018 (Every Sat & Sun), customers can get the chance to redeem one BE@RBRICK Towel or BE@RBRICK Swim Ring with same-day spending of HK$3,000 or above by electronic payment (limited to credit card / EPS / Octopus) at any Harbour City retail and F&B outlet. It's time for Summer Water Fun! Let's make a splash with various summer-perfect BE@RBRICK water games with your kids and family. You can also have chance to win adult / kids T-shirt and a set of summer-look BE@RBRICK stickers that are Not for Sale! Customers are eligible to redeem one game card by any one of the following methods. 2) Presentation of a single machine-printed receipt* on the same-day with purchase of HK$200 or above at Harbour City retail, F&B outlet or BE@RBRICK Tuck Shop. Various performers are creating big splashes of fun this Summer with Water Play Party every weekend! The party includes water drums, bubbles and plenty of water to help guests stay cool in the Summer heat.